X-ray Yankee Zulu is a series of text pieces that play with the mutable and viral attributes of language. 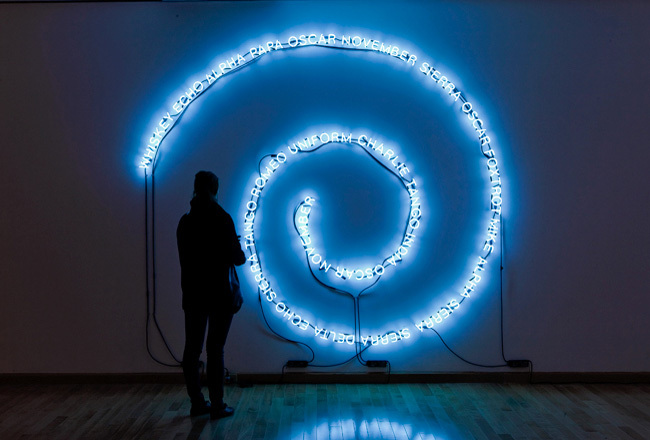 The work consists of three wall-mounted spiraling neon signs that use the NATO Phonetic Alphabet to spell out the phrases "weapons of mass destruction", "improvised explosive device" and "global positioning system". The NATO Phonetic Alphabet is a voice transmission technique that assigns code words to letters of the alphabet (A = Alpha, B = Bravo, C = Charlie) and is used to ensure the accurate delivery of messages over radio networks. Introduced by international telecommunications agencies in the 1920s, this method of voice communication has been adapted by various Western militaries. The NATO version—universalized by the International Air Transport Association (IATA)—has become commonplace through its use in media and popular culture. The neon texts take their structure from a rigid technocratic and military context but the visual result of their display is more layered and ambiguous (the words could be mistaken for a line of surrealist automatic writing). The terms "weapons of mass destruction", "improvised explosive device", and "global positioning system" are now widely and casually used in English as acronyms, but refer to deeply complicated and volatile things. 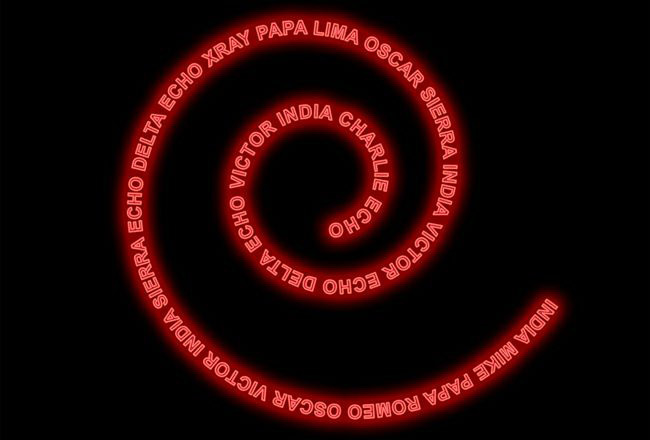 The use of the NATO phonetic alphabet to re-encode these abstract terms is an attempt to undermine the way in which they have been distorted, obscured, and trivialized.